This Cheesecake Recipe is the only recipe you’ll ever need for Cheesecake. 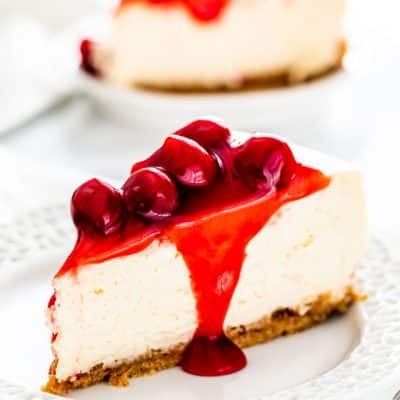 A dreamy, decadent, rich, smooth and utterly delicious cheesecake topped with cherry topping! This really is what cheesecake dreams are made of! 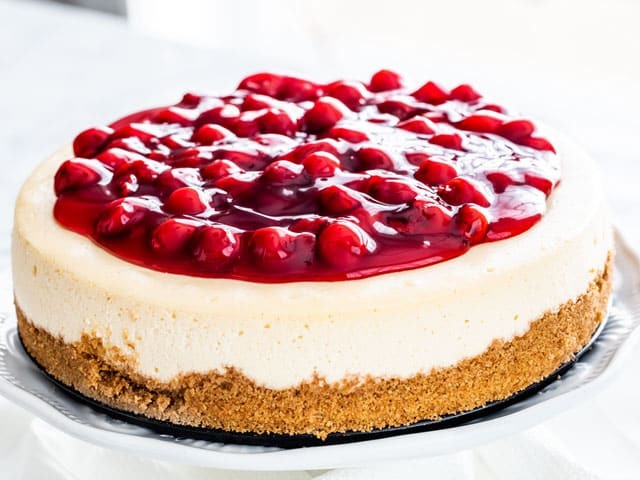 Cheesecake is rich dessert that everyone loves. We’re talking dreamy, decadent, creamy, delicious bliss. It’s no surprise that cheesecake is my favorite dessert. Which is why I don’t make it often. I can’t help myself from eating it. If I know there’s cheesecake in my fridge, that’s all I can think of. However, for your sake, my readers, I made this gorgeous New York Style Cheesecake. Because let’s face it. New York Cheesecake is the best kind. New York Cheesecake is more dense, smooth and rich than regular cheesecake. Not to mention that it’s a taller cheesecake. Some would say all other cheesecakes are frauds. Who am I to argue that point. While it may seem like cheesecakes are complicated to make, they really aren’t. With my tips, you can rest assured that you’ll end up with a perfect cheesecake all the time. There are really only two parts to making cheesecake. The crust and the cheesecake batter. The crust is super simple to make. You need graham crackers and butter. Pulse them together in a food processor, then press firmly onto the bottom of your pan. Bake for 10 minutes. In a New York cheesecake you need lots of cream cheese. I used five packages of cream cheese. The other ingredients are sugar, flour, vanilla, sour cream and eggs. Beat the cream cheese first until it gets to be nice and smooth and there are no lumps. Add the rest of the ingredients, except the eggs and continue beating. Add the eggs one at a time and avoid over mixing, as too much air could get into the cake. Make a water bath. A water bath basically means that you place the springform pan in a large pan such as a roasting pan and fill the roasting pan with hot water. 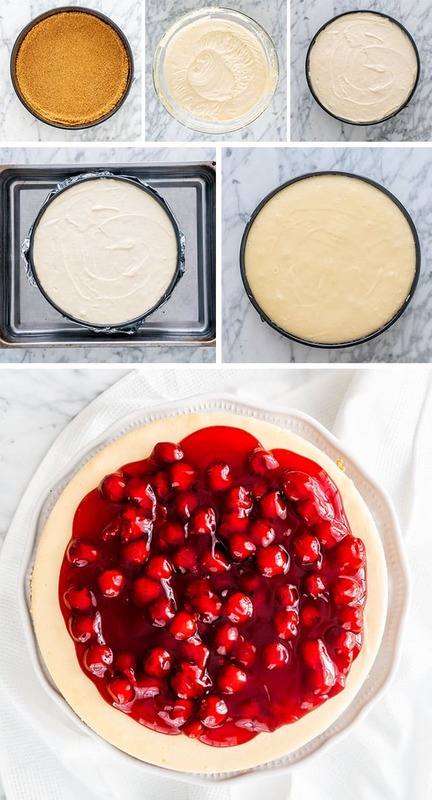 This method is used because cheesecakes thrive in a humid environment and it prevents the cheesecake from cracking. 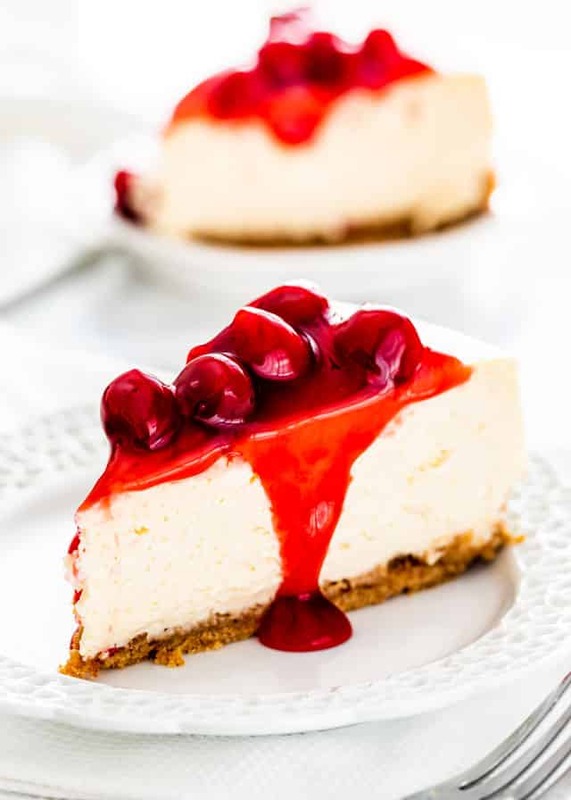 This method also helps to make the cheesecake extremely smooth and creamy. Avoid opening the door while the cheesecake is baking since big cracks are caused by drafts or temperature changes. Do not over bake! This is the biggest cause of cracking. Use a little bit of cornstarch or flour in the cheesecake batter. Not only does this prevent the cheesecake from cracking but it also makes it easier to cut into clean slices. Avoid cooling your cake too fast. A common practice to cool your cake is to let your cake cool in the oven. After it’s done baking, turn off the oven, and open the oven door. Let the cake cool in the oven until it comes to room temperature. Run a thin-bladed knife around the edge of the cake, to make sure it isn’t sticking to the pan. As the cake settles, this can also prevent it from cracking. To check if your cheesecake is done baking, gently shake the pan. If the cheesecake looks nearly set, but the center is still a bit jiggly, it is done.The center will firm out as the cake comes to room temperature and chills. Always use ingredients that are at room temperature. Especially when it comes to the cream cheese. If your cream cheese is at room temperature, it’s a lot easier to mix and won’t leave lumps. Do not add the eggs until the end. Make sure your cream cheese is mixed thoroughly and it’s as smooth as possible. Add the eggs at end one at a time. They hold air inside the batter which could cause cracks in your cheesecake. Do not open the oven door while the cheesecake is baking. It’s difficult but if you want to see how your cheesecake is doing, use the oven light to peek inside. Cool the cheesecake until it comes to room temperature. Cover tightly with plastic wrap and refrigerate overnight, or at least 4 to 8 hours. This Cheesecake Recipe is the only recipe you'll ever need for Cheesecake. 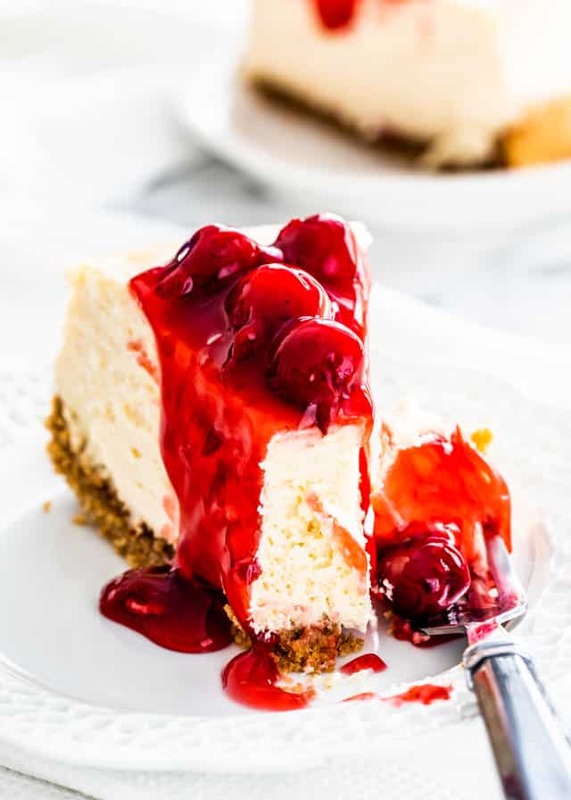 A dreamy, decadent, rich, smooth and utterly delicious cheesecake topped with cherry topping! This really is what cheesecake dreams are made of! Add the graham crackers to a food processor and pulse a few times until crumbs form. Add the melted butter and pulse a few more times. Transfer the crumb mixture to a 9-inch springform pan and press firmly onto the bottom of the pan. Use a measuring cup to firmly press the crumbs into the pan, it's much easier. Place the pan into the preheat oven and bake for 10 minutes. Beat the cream cheese, sugar, flour, and vanilla in a large bowl until smooth and there are no visible clumps. Mix in the sour cream. Add the eggs, one at a time and mix on low speed until well blended. Do not over mix. Scrape down the sides of the bowl and remix as necessary. Pour this batter over the baked crust. Place the springform pan into a larger roasting pan and fill the pan halfway with boiling water, make sure it doesn't go over the foil. Transfer the big roasting pan into the oven and bake for 1 hour and 10 minutes. To check if the cake is done, shake the pan and the cake should pretty much be set, except for the center which should still jiggle slightly. Turn off the oven and leave the oven door open. Let the cake cake cool in the oven until it comes to room temperature. This should prevent cracks. Once the cake is cooled completely, refrigerate for at least 4 hours to overnight. This helps the cake set. Top the cheesecake with the cherry pie filling. Slice and serve. You won't be able to use an 8-inch springform pan since there is too much batter and it won't fit, but you can use a 10-inch or a 9-inch. Store your cheesecake in the refrigerator for up to 3 days, wrapped with plastic. If you have an airtight container, it will last up to 5 days. 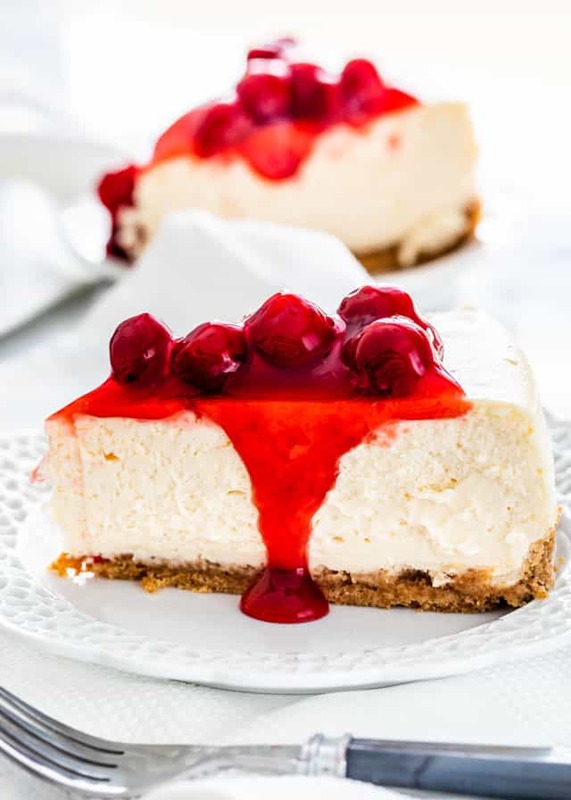 To freeze cheesecake, it's best to freeze individual slices. Wrap individual slice in plastic wrap or foil then place them in a ziploc bag. Place the ziploc bag in the freezer. Cheesecake will last up 3 weeks in freezer. You can also freeze an entire cheesecake, wrapped properly and it will last up to 6 weeks. Thaw cheesecake overnight in the refrigerator. Planning on making two of these tomorrow for work on Monday, with homemade strawberry and homemade blueberry toppings Can’t wait to try this. I have used the water bath technique before, and will attest that it works! Very important to cool it down while still in the oven. Thanks again!! Hi Jo, Can you pease make a coconut cheesecake. I made this recipe two times already and its just awesome. It has become my #1. This is the most delicious cheesecake ever. I made 4 for Christmas gave some as gifts and nothing like a homemade gift. Taking three to a lunch Sunday. 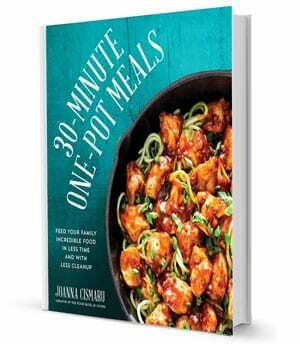 Thank you so much for the recipe my family greatly appreciates it too. One question I don’t leave mine in the pan sometimes it cracks are you suppose to leave the pan on the bottom. Probalby a crazy question right. IF you’re using a springform pan like we used, we kept it on the bottom part of the pan! This looks so good. I can’t have dairy, so can I use Tofutti cream cheese and sour cream instead? 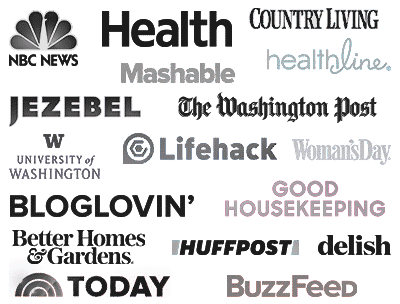 Would I need to add more Vanilla as to subs are more bland. I love cheesecake but do not like getting sick after having dairy. We have never made cheesecake with Tofutti, but I’m sure it’ll work out just fine! Give the batter a taste and if it’s too bland you can add some more vanilla. It says not to pour to much water as not to go over the top I’m assuming you mean the top rim of the pan? Thanks. This is by far the best cheese cake I have ever baked. Thank,you for sharing your recipe and easy to follow directions. I have made 2 in the last month. Lol. New to maki h this. How do you remove it from the pan so neatly?? You have to let the cake cool and then chill in the fridge. During this time the cake will loosen from the side of the springform pan. If it hasn’t just run a knife around the edge to loosen the cheesecake. Then simply release the clamp and remove the band from the springform pan. Is batter baking temp same as crustbaking temp? 325 degrees for 1 hr 10 min?? Does not specify. Yes, the oven is the same temp for both the crust and batter. GTEAT RECIPE! CAN’T WAIT TO TRY IT!! Hi. In the ingredients you said 2 cup graham crackers. I didn’t understand. You meant 2 cups graham crackers crumbs? How many whole graham crackers? I used about 16 long ones. Nooo! 🙂 Don’t think about the fat, just enjoy it! Thanks for all of the helpful information, especially explaining why cheesecakes can crack. This looks delicious! My pleasure! Hope you try it!